Is this decent battery life? Discussion in 'iPhone' started by mnsportsgeek, Aug 19, 2011. 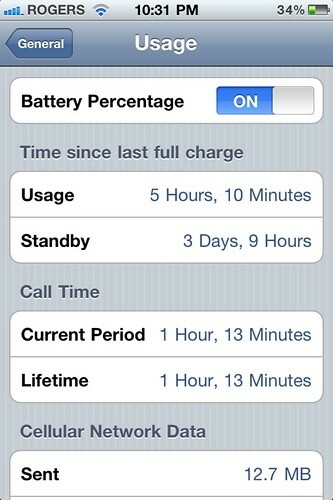 I was just wondering if this battery life is decent or if I should be expecting better out of my iPhone 4. 2 days seems pretty good to me. Looks decent. Although anyone care to tell me what mine is like? This is what it gets on average. The only answer to this question is "it depends what you were doing while it was *in use". If you were listening to music with the screen off the entire time it was in use, then 5 hours use + 2 or 3 days standby is ok. Rated standby time is "Standby time: Up to 300 hours". If you're playing a 3d game on full brightness for 5 hours, or streaming an HD video over 3G at full brightness, don't expect 300 hours, or even 2 or 3 days standby. I was surfing the web and playing angry birds for my usage. Wow I must be heavy user cause my usage is 4-5 hours/day not in 2-3 days like posts. I would consider that amazing usage. That should be about right although I get about 9-10 hours on Wi-Fi. And I am still at 4.0 and use airplane mode alot. Of course you did have your usage in two days of standby. It really depends on many factors like if you have push notification on, location services, screen brightness, and if you can close all the apps in the multi-task bar. And if it gets you too paranoid like it has for me, I suggest to turn off the battery % which eliminates the battery OCD. Also to keep the battery "topped off" and not have anything less than 20%. I was guilty of draining it all the way down until it died which isn't the right thing to do. More shallow charges, the better. Only do long charges at least once per month. Lately, I have been buying other phones to do some of the multimedia and Wi-Fi duties, so my iPhone 4 only gets charged every 3-4 days when it is about 20%-30% by that time. So anytime you are around a charger with it and it is at 20%-40%, charge it. This eliminates testing your battery life all the way through like I did. More charges + turned off batt % = less anxieties and less testing the batt life. Charge it everyday if you need to. I don't know who started this rumor, but applications running in the background aren't actually running. For an application to be wasting battery in the background, it has to have permission from the OS, and it has to fall under one of the special categories (GPS/location monitoring, background audio, voip, etc...). The most an application can stay running in the background without being a special app is exactly five minutes. All other applications are completely asleep in RAM and waste no resources. If the foreground application requires more RAM, the OS instantly and automatically terminates applications with the lowest priority (such as apps that haven't been used in a while, and apps that don't use any of the backgrounding services). Please spread this around, and don't let people believe that having to frequently clear out the multitasking bar is part of the iOS experience. That's pretty good I think. I'm usually just under two days.